﻿My wife collects Precious Moments figurines. Most of the little statuettes that reside in her curio cabinet were given to her by me on various special occasions or holidays because (a) I love her, (b) she likes them, (c) they make a convenient gift when I don’t know what else to get, and (d) I can’t afford the European and Polynesian vacations I’d like to give her. I’m not a Precious Moments collector myself, and so Debra does not customarily bestow the figurines upon me. She did once give me one, however, and it has resided in my various offices over the years ever since; indeed, I can see it from where I sit as I type these words. The figurine is of a little boy standing behind a pulpit; the pulpit is adorned with a cross and has a Bible sitting atop it. The boy is wearing a suit and a bow tie and an expression that I can best describe as a cross between resigned and bemused. He has smudges on his face, a bandage on his forehead and a broken egg atop his head; the pulpit and the floor around him are splattered with eggs and vegetables. That precious Precious Moments figure reminds me, in its cute and endearing way, that the pulpit can be a dangerous place but that the preacher can count on those who love him or her (as represented by the puppy) and on the good Lord—and that he or she can do such counting no matter what eggs or tomatoes or slings or arrows come. And they will come. As a sign in my study tells me, we preachers are called to “comfort the afflicted” and to “afflict the comfortable.” When we do the latter, particularly on those rare occasions when we muster the courage to name as sin those sins that are not the generally agreed upon acceptable sins to talk about in our particular community, then we can expect the slings and arrows and eggs. You know the sins I’m talking about, the things that everybody thinks of as sin but that either (a) we all know that certain folks aren’t going to stop doing but we figure the preacher is obligated to speak against or (b) we think are being committed only by people we don’t hang out with anyway but who are probably more prevalent in our congregations than we think they are. When we talk about those sins that the Bible clearly names as sin but that nobody wants to face up to as being sin—things like prejudice, greed, profiting at the expense of the poor and vulnerable, for example—we might even get criticized and talked about when we “comfort the afflicted.” This is because there are always those among us who think that certain afflicted ones shouldn’t be comforted because they brought it on themselves or because they don’t deserve it or because of some other attitude that ought not be held by anyone who really takes Jesus seriously. Still, if we preachers are faithful and true to the prophetic side and even to the priestly side of our calling, we can expect the tomatoes and eggs and slings and arrows—metaphorically speaking, of course. But what about bullets? And I’m not speaking metaphorically. Earlier this year, a man walked into the First Baptist Church of Maryville, Ill., had a brief conversation with pastor Fred Winters and then shot him. The minister died from his wounds, and his assailant was wounded by his own knife when two parishioners tackled him. It is a terrible tragedy for the family of the minister, for the family of his attacker and for the family of faith at First Baptist Maryville. It also makes me think about how vulnerable my church is—and all churches are—and about how vulnerable I personally am and how vulnerable all preachers are. It causes me to ponder the steps our church should consider taking to enhance the security of our worshipers and of our preacher, who happens to be me. Some advocate for detailed security arrangements for churches, perhaps even involving armed guards. 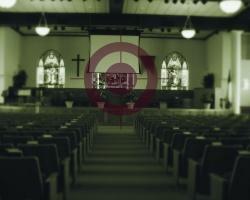 There are now firms that will help churches develop such plans. On the one hand, churches certainly have a responsibility to try to protect their parishioners from harm. At the very least all churches should probably make their adult members aware of the need to keep an eye out for people, particularly strangers, who behave in suspicious ways. On the other hand, we don’t want to become too paranoid in such efforts because, after all, we are called to minister to all people; and not all who appear strange are a threat. Besides, hospitality to the stranger and sojourner in our midst is basic to our calling as the church. The balance is between security and hospitality, between safety and openness, between protection and vulnerability. The word vulnerability is one that keeps popping into my mind as I think about this. We are vulnerable. We should be vulnerable. We will always be vulnerable. More specifically, I am vulnerable, I should be vulnerable and I will always be vulnerable. Christianity means vulnerability; ministry means vulnerability. I will not take foolish chances. If someone had expressed specific threats against me, I might consider temporarily wearing a bulletproof vest under my preaching suit (maybe that would give me an excuse to wear a robe like I’ve always kinda sorta wanted to do); but I can’t see wearing one all the time. I certainly don’t want our church to take foolish chances, and I would be in favor of our becoming more security conscious; but I don’t want us to become overly suspicious and paranoid. Frankly, it’s hard for me to imagine how a church and a preacher could reasonably guard against the kind of thing that happened that Sunday in Illinois. If someone walks into our church, I will greet him. If he wants to speak with me, I will speak with him. If in that context he wants to do me harm, he will probably do me harm. If he can be stopped, I’m sure the members of my congregation will try to stop him. I want the people I pastor to know that I want them—I want us—to be safe. I want them to know, though, that as we minister to real people in the real world, people who are in danger in their own way in their own world, we just may get hurt. I hope not. I hope they don’t get hurt, and I hope I don’t either. Chances are good—excellent, really—that what hurt we encounter or that I encounter will not involve bullets or even slings and arrows or tomatoes. But sometimes helping to heal the hurt of people involves taking some of their hurt onto yourself—I think that’s part of living the crucified life. Yes, there is danger in the pulpit because the pulpit is in the church, and the church is in the world and the world is a dangerous place. I hope that the hurting don’t hurt me; I hope that they don’t hurt us. But I also hope that the hurting will keep coming to us because in coming to us, they just might find the Christ who—willingly and purposely—died for them.